First Line: The leaves rustled on the bushes ahead. Summer ("Sam") Westin is working on a twelve-week project for the National Park Service in Olympic National Park. One night when filling in as a firewatcher, she hears an explosion and sees fire light the sky over at Marmot Lake. When the fire is put out, the body of a young woman who was working on the park's trail crew is discovered, and she's barely alive. Sam senses that something's going on, and she begins to ask questions. With each question she asks, three new ones pop up. Does the explosion have anything to do with an old gold mine? Are illegal bear hunters poaching on what is now National Park land? And what is the significance of all the weird numbers she's finding carved on trees? No matter how fast Nevada Barr writes her Anna Pigeon books, she can't do it fast enough, so I am thrilled that I've found Pamela Beason's Summer Westin series. Since "Sam" is a wildlife biologist, blogger, and photographer and not a law enforcement ranger, readers are able to see beautiful remote locations and learn about the wildlife that inhabits it from an entirely new perspective. Sam is smart, strong and dedicated, and although I was happy to see that she didn't carry a gun in the first book in this series (Endangered), I may have to change my mind. 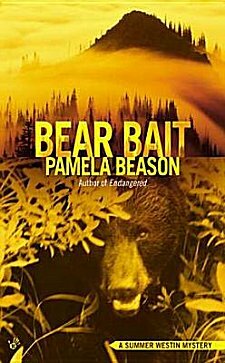 More than once in Bear Bait Sam is reckless with her life-- camping alone in areas where she's seen illegal-- and very unfriendly-- hunters. The handsome FBI agent she's falling in love with isn't around often enough to keep hauling her bacon out of the fire. I would really like to see this element of her character toned down a bit. If she's so intelligent, she should be smart enough not to endanger her own life stupidly. Secondary characters assume more importance in this book, I'm happy to say. Sam's clergyman father has always been disappointed in his daughter, believing that she's not living up to her true potential. He redeems himself-- and rises from the ranks of a stock character-- in a very touching way. Same, too, with Joe, a ranger in the park, his wife Laura and their thirteen-year-old daughter Lili. Beason shows us that raising a child in a remote area can be every bit as treacherous as raising one in the city. This subplot with Lili isn't tied off neatly at book's end, which I liked. There's enough ambiguity left for the reader to wonder what path Lili will choose to take. The setting is superb, and I'm not just saying that because I've been there. Getting around this incredibly beautiful area called the Olympic Peninsula isn't easy. Roads are few, and you often find yourself relying on a ferry schedule to get to any kind of city. The reader gets a real sense of this, and also has a few chuckles along the way, since Forks is the nearest town of any size. Most of us have heard of other characters with which someone named Stephenie Meyer populated the town in a very different series of books. Many important environmental issues are also touched upon: the issues surrounding public land that is turned over to the National Park Service, illegal bear hunting, and outdated mining laws involving abandoned mines to name three. All this, and a climactic scene that contains heart-pounding suspense and a speech that can bring a tear to the eye. Anna Pigeon, if you were twenty years younger, I'd feel a bit disloyal saying this, but... Move over: there's a new woman in town, and her name is Summer Westin. Cathy - I'm glad you liked this one as much as you did. I love the National Park setting (reminds me just about of Nevada Barr's Anna Pigeon series). And the mystery sounds interesting too. It's a wonderful series that I'm certainly glad that I found, Margot!